The image of a house with a vegetable garden in the yard is an iconic part of American culture. Many gardeners look forward to receiving their vegetable seed catalog in the mail during the winter, and start their plants indoors in seed pots. Other gardeners, however, live in apartments or townhouses and have no opportunity for creating their own vegetable garden in the yard. These residents can still enjoy growing their own fruits and vegetables in community gardens. A community garden can be as simple as a vacant lot that a group of gardeners divide into individual plots or it can be a larger tract with utility buildings, farm vehicles and utilities. These gardens can be owned by a non-profit group or a municipality and can be leased to individual gardeners, who share maintenance responsibilities. Community gardens can be found at schools, hospitals, or parks and are located in both urban and suburban municipalities. Energy Conservation: Community gardens inherently conserve energy because they reduce transportation costs and unnecessary fuel consumption associated with food production. Support Healthier Lifestyles: Community gardens create opportunities for recreation, exercise, therapy, education and self-reliance. Education: Community gardens provide opportunities for gardeners to learn practical job skills, life skills, and experience stewardship/environmental responsibility. Food Source: Community gardens can be a source of affordable nutritious foods for families. Environmental Education: Community gardens provide opportunities for youth to gain an appreciation of the natural world and to learn how to interact with others in a socially meaningful and physically productive way. Neighborhood Values: Community gardens can increase a sense of ownership in a neighborhood, and provide opportunities to interact with neighbors. Green Space: Gardens can provide needed green space to promote awareness of natural environments in an urban setting. Environmental Benefits: The gardens can filter rainwater, helping to keep lakes, rivers and groundwater clean. Cooperation: Community involvement is required through the entire development process in order to best ensure ongoing satisfaction with the community garden. Rules and Regulations: Rules need to be established that address issues such as fees, amenities, accessibility, and inspection schedules. Insurance: The organization managing the garden might be required to obtain liability insurance coverage. 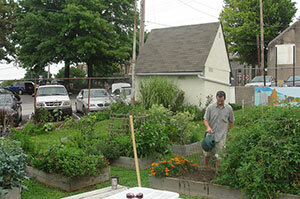 A committee should be formed to determine the need for a community garden. Consideration needs to be provided for the type of garden envisioned (vegetable, flowers, organic, or a combination), the population it will serve and the benefits they will receive. The committee will need to develop and coordinate a support group of volunteers who are willing to share their time and knowledge. The committee should also reach out and arrange for sponsors, such as churches, schools, private business or parks and recreation departments, who can donate supplies or funds. A prominent and convenient location should be considered. Soils testing, amount of daily sunshine, water availability, length of available lease and insurance issues also need to be addressed in the site selection process. For vegetable gardening, the site should get at least six full hours of daily sunlight. Once a site is chosen, it is very likely that considerable preparation will be required for cleaning, gathering materials and arranging the site layout. The design of the community garden itself should provide for specific plot sizes and plot markers, along with plans for equipment storage and compost areas, pathways between plots, and a rainproof bulletin board for messages and event notification. Any fees associated with renting a garden plot should depend upon the size of the rental plot, maintenance requirements and operation costs, and any amenities being provided (such as tools, organic compost, seeds, and trash disposal). Perimeter fencing and landscaping should be provided, for security purposes, and to help promote goodwill with neighbors and municipal officials. Consideration should also be provided for allocating a certain area of the garden for children. This will allow them to explore gardening at their own speed of learning, and provide local outreach of day care providers, local scout troops and church groups. The committee will need to develop the bylaws or organizational guidelines for the community garden, in order for the operations and maintenance of the garden to be carried out in a most efficient manner, and maintain good communication between members. These guidelines will need to ensure that the rules of the garden are maintained, maintenance responsibilities are carried out on a scheduled basis, and procedures are set in place for dealing with vandalism, or damage caused by inclement weather. The PA Municipalities Planning Code (MPC) states that a municipal or multimunicipal comprehensive plan should include a plan for community facilities and utilities. The American Community Gardening Association encourages community gardening and greening across the United States and Canada American Community Gardening Association (ACGA). The National Gardening Association (NGA) has been working to renew and sustain the essential connection between people, plants, and the environment. The PA Department of Conservation and Natural Resources website on community gardens includes sample community garden guidelines and rules. The Schuylkill River Park Community Garden contains around 70 garden plots. The land is owned by the City of Philadelphia Fairmont Park Commission and is leased to the Center City Resident's Association.